On Friday the 27th of May the CERGE-EI community united once more to commemorate 25 years of world-class economics research and exceptional education. Filled with superb speeches, exquisite cuisine, musical performances, and dancing, this affair was no doubt a delightful occasion for all. Qatar, Spain or Canada, no matter where they reside now, alumni journeyed from near and far to reconnect and revive their student memories. Joined by local faculty, students and staff as well as visiting US members and supporters, all were summoned to take full advantage of the lambent halls of Schebek Palace with a charming spring evening at the 25th Anniversary Gala. Elegantly dressed and champagne in hand, no smile was left uncaptured as guests entered along the red carpet staircase to receive their welcoming happy snap in the photo booth. During the champagne reception over 200 guests buzzed around greeting familiar faces and new acquaintances, whilst in the backdrop a slideshow flicked through the 25 years of memorable moments at CERGE-EI. Managing to draw in the guests at 7pm, Master of the Ceremony, Susan Walton, opened the speeches by welcoming Michal Kejak, CERGE-EI Director, onto the stage. Mr Kejak kept it simple and brief, yet was not short for words as he sent his kudos to the CERGE-EI community for their fantastic achievements. He highlighted several remarkable results including having produced almost 500 articles in international impact journals, as well as 9 articles being published in top 5 economic journals since 2010. Moreover, CERGE-EI has been the first institution in the Czech Republic to receive prestigious grants from the European Research Council in economics, and within the first two in social science, having produced 75% of all of Czech’s impact factored articles in economics. 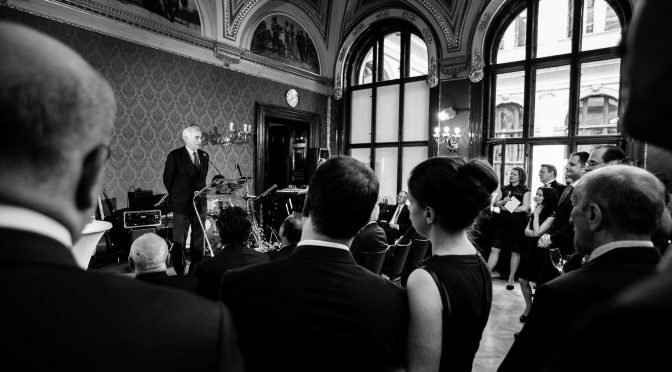 Keeping true to the commemorative nature of a quarter century milestone, co-founders Jan Švejnar and Josef Zieleniec captivated the audience as they reminisced on the triumphs and hardships of bringing CERGE-EI to fruition. Having met on a riverboat in Vienna, Švejnar and Zieleniec bonded over their common vision to bring the science of modern economics to Czechoslovakia and the Eastern Bloc. Surrounded by the lingering skepticism of the Soviet era Zieleniec recalls that, “very few people understood what we wanted to do… not only to establish modern mainstream economics, but an international and open institution.” In spite of this, Švejnar and Zieleniec soon relished in the success of their very first PhD in Economics graduate in 1995, Jacek Cukrowski. They quickly saw CERGE-EI grow internationally, not only as a driver for economic education but also propelling economic reform in the Central Eastern European region. The recollections continued as Tomaš Zima and Jiří Drahoš were invited to address the crowd. As Rector of Charles University, Mr. Zima reflected on the success CERGE-EI has had in fulfilling the aims that Roman Emperor Charles IV himself had set out for Charles University back in 1348. Mr. Zima noted that not only has CERGE-EI attained Charles IV’s main vision by becoming an open international school with world-class researchers and global connections, but has also gone beyond by playing an influential role in society through think tanks and expert research in public concerns. A growing appetite for dinner after such evocative speeches was swiftly quenched as the premium and buffet banquet was served. This was the perfect chance for guests to savor the Moravian red wine donated by CERGE-EI Foundation member, Craig Stapleton. Once stomachs were satiated with exquisite cuisine the mid-evening entertainment was kicked off with a CERGE-EI “25 Years of History” quiz. A challenging team tournament of CERGE-EI knowledge for which the winning team, the Quasi-Convex Puppies, received champagne, goodies and eternal CERGE-EI glory. The accolades carried on when Jan Švejnar returned to the podium to announce the 2016 Alumni Awards. Mr. Švejnar presented Gurgen Aslanyan the Alumni Award Winner and Jindřích Gallo the Honorary Alumni Award for their significant contributions to society over the past 18 months. The night’s commendations were vivaciously celebrated when the official after party was launched with the student band singing a CERGE-EI cover of ‘What’s Up’. With the live band bringing up the energy, everyone was eager to show off their dance moves under the chandeliers and frescoes in the main ballroom well into the morning. Being the 4th Gala running, the annual occasion is quickly becoming a beloved tradition for the CERGE-EI community to unite and revel in the year’s triumphs. As the 25th Anniversary Gala of CERGE-EI being founded, this year’s gala was all the more festive to aptly celebrate 25 years of diligence and zeal towards economic research and education. Previous PostNot listening? Well, it’s only rational.Next PostCan it be rational to overweight very unlikely events?